It’s true that we want a gentle, and yet fulfilling, life. Some excitement, but not sorrow. Much support, and more love. The trick is gaining our balance. Finding our equilibrium. Today’s message arrived in a flash, it was strong and clear. It speaks to that need for harmony, for symmetry. Because of the reality of our existence, the limits of these bodies, we know that we can’t be serene every minute of every day. We also know that we’d still like our experiences to be more good than bad. Are we looking for ways to be at ease, to rest and rejuvenate? Or are we promoting the suffering by feeding in to that energy of dissatisfaction? Do we try to find the lovingkindness in our day-to-day? It’s there. That grace. Are we seeking it out? We can’t find what we don’t look for, that’s simply a fact. To begin each project, event, adventure with a true and peaceful heart is to know that we are giving it our best. We are striving for that serenity which our soul craves. We must be conscious of it. Aware. In touch with what makes us joyful. If we aren’t seeking our peacefulness, we won’t be finding our peacefulness. On our card altar right now we have one of those disconcerting images, the ones that often startle, instead of soothe. What we must remember though, as we read the description, is that it’s like going in search of our serenity. There’s more to the journey than that first glance. There’s always more. So let’s not toss out the importance of what’s being said merely because our gaze sees a view that possibly differs from what others might be perceiving. 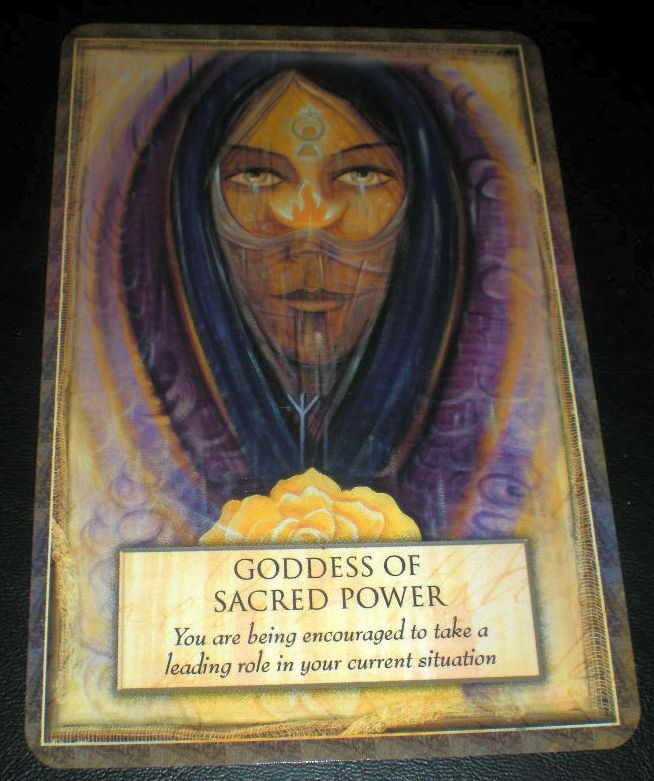 You are being asked by Goddess/God and the Universe to take a leading role with regards to a project or family issue you are currently involved in. The current situation is in need of leadership and direction. Sometimes, being too democratic simply doesn’t work. If you look at life honestly you will realise that everyone has their own opinion on how they think things should be done. It is not so much a matter of who is right or wrong. What is important right now is that someone takes control. It is better to steer a ship somewhere, rather than have it drift aimlessly wherever the wind may blow. I will be strong as I lead with love and angelic divine guidance, so that this situation is resolved peacefully, quickly, positively, and for the highest good of all.